Haunting, possibly even evil is this fascinating plant displaying the rudiments of a bat. Large whiskered face is surrounded by luscious green leaves and given the right conditions makes a nice house plant, too. It is also called the "Devil's Plant". Proper name: Tacca chantrierei If you like to collect and grow bizarre plants then this family of plants is for you. 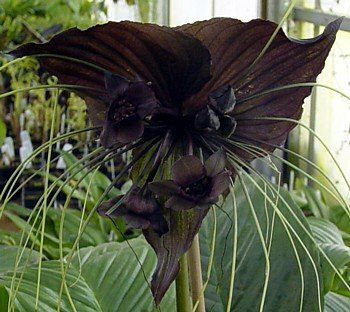 The rare Black Bat Plant produces a sinister looking nearly black flower that looks like a black bat in flight. The center of the flower develops a small bat face. These plants are native to India, Malaysia and some of the islands in the Indo-Pacific region.